It's Berlin, 1940, and the city is filled with fear. At the house on 55 Jablonski Strasse, its various occupants try to live under Nazi rule in their different ways: the bullying Hitler loyalists the Persickes, the retired judge Fromm and the unassuming couple Otto and Anna Quangel. Then the Quangels receive the news that their beloved son has been killed fighting in France. Shocked out of their quiet existence, they begin a silent campaign of defiance, and a deadly game of cat and mouse develops between the Quangels and the ambitious Gestapo inspector Escherich. 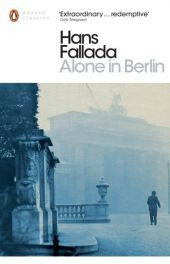 When petty criminals Kluge and Borkhausen also become involved, deception, betrayal and murder ensue, tightening the noose around the Quangels' necks ...Inspired by a true story, Hans Fallada's Alone in Berlin is the gripping tale of an ordinary man's determination to defy the tyranny of Nazi rule. This Penguin Classics edition contains an afterword by Geoff Wilkes, as well as facsimiles of the original Gestapo file which inspired the novel.Berlin, 1940, and the city is filled with fear. At the house on 55 Jablonski Strasse, its various occupants try to live under Nazi rule in their different ways: the bullying Hitler loyalists the Persickes, the retired judge Fromm and the unassuming couple Otto and Anna Quangel. Then the Quangels receive the news that their beloved son has been killed fighting in France. Shocked out of their quiet existence, they begin a silent campaign of defiance, and a deadly game of cat and mouse develops between the Quangels and the ambitious Gestapo inspector Escherich.